Oregon Employment Department: Food Manufacturing a "Staple of Oregon's Economy"
Food manufacturing is a key part of Oregon's agri-cluster, as our new report shows. Freshly released statistics from the Oregon Employment Department further demonstrate just how important, and stable, food manufacturing is for Oregon. "Wine Region of the Year"? You Bet. A major wine website has selected Oregon as its 2013 "Region of the Year," recognizing the high-quality growing conditions, and winemaking expertise, that our state has fostered. Not just the Willamette Valley. The whole state. We love visiting with the people that make Oregon agriculture great. 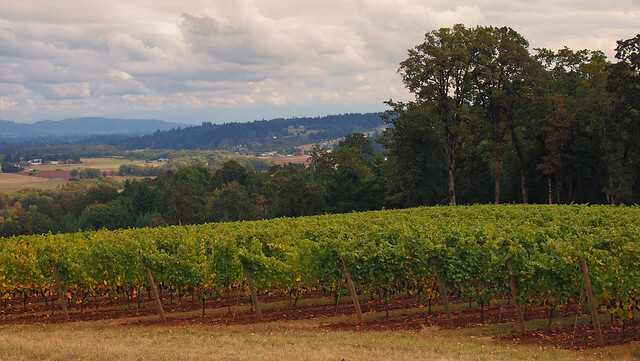 In September we stopped by at Winter's Hill Vineyard, in the famous Dundee Hills of Yamhill County. Winter's Hill is a family-run winery that has been growing grapes since 1991. The Gladharts apply a strong sense of care for sustainability and community into everything they do at Winter's Hill. Throughout the year, we'll be featuring stops on our Land Use Trail. Today, October 30: Corvallis, a sustainable city located in the Willamette Valley that’s been repeatedly recognized as one of the top 10 places to live in America. Should We Allow More Dwellings in Farm and Forest Zones? Three counties in southern Oregon received funding to review possible variations in allowed uses and minimum lot sizes in land zoned for farming and forest use. This pilot program is beginning its second and final year. The outcome(s) could have implications for farm and forest zones throughout the state. Friends of Polk County, a 1000 Friends affiliate organization, has arranged a panel discussion in the Willamette Valley to review progress to date. After a consultant paid by a shopping center developer made revisions to a draft Economic Oportunities Analysis in McMinnville--revisions that more forcefully stated a "need" for a new regional shopping center--a member of the city's Advisory Committee is crying foul. Throughout the summer, we'll be featuring stops on our new Land Use Trail. Today, August 12: French Prairie. This area, among Oregon’s first to be settled by Europeans, remains one of its most significant farming regions.